for a Fresh Locations exclusive house! At Fresh Locations we have an impressive location library of exclusive properties – we’re so proud that they’ve chosen us to be their sole agency. One of them, our ‘Greenways’ property, has been hitting the headlines recently as the winner of not one but two rather prestigious architectural awards. Firstly it beat an incredible shortlist to bag the The Sunday Times British Home Awards Large House of the Year. Next came the illustrious Manser Medal, conceived to inspire innovation in-house design. These awards are a huge boost for the architects, Eldridge London but, in this case, the owner must claim a little of the credit too. Jim Mason has his own company, designing bespoke hospitality events, but his creative streak has also manifested itself in a lifelong interest in architecture, ‘it has always been a great passion of mine. I like the contemporary style and natural materials, especially the work of Swiss architect, Peter Zumthor, ’ Jim enthuses. So it’s no surprise that he was looking to realise his architectural dreams when he found this site, in 2007. Back then, the half-acre of land was occupied by an unremarkable post-war bungalow. ‘But it was a beautiful site with so much greenery and so near to London’ he says. Jim, then a single parent to his daughter, now 19, he was looking for a project to plough his architecture obsession into. But he needed to do this in partnership with an actual trained architect. He consulted the RIBA, who helped him put together a shortlist based on his budget, tastes and needs. He interviewed them all and struck up a rapport with Nick Eldridge of eponymous practice Eldridge London, ‘I spent a lot of time with Nick. He understood me and my daughter and appreciated the landscape here with its slope and old oak trees.’ Mason’s brief to Eldridge was to create a house that sits within the landscape rather than looking ostentatious, something that turns its back on the road and disappears into the ground. Starting work in 2012, Eldridge remodelled the landscape itself to make the most of the slope and create a secret ‘underground’ level that’s unseen from the road but opens on to the now gorgeous gardens. 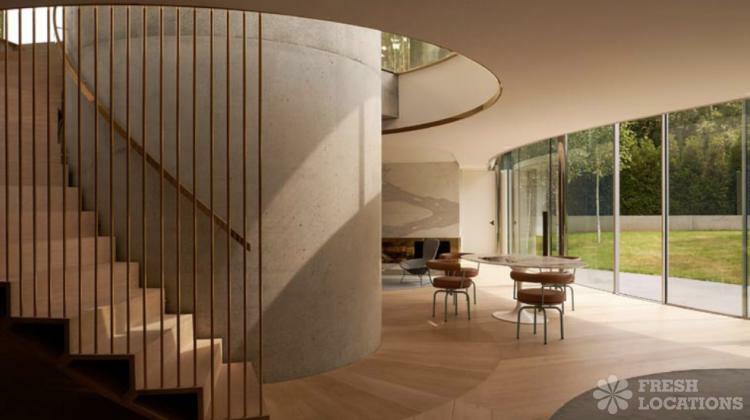 The house is set over three tiers but when you first arrive all you can see is the largely glazed ground floor rotunda with a striking pod above it. This contains the master suite that enjoys green vistas of the surrounding tree canopy. Once inside the entrance, you’re drawn down a sweeping staircase down to the main level. This cleverly winds around a second ‘secret’ staircase in its core that privately connects the master suite level to the lower two floors. The curving, trefoil-like plan of the main house was based on the form of a favourite oak tree in the garden, ‘all the curves reach out from an axis through the centre of the house and everything in the house is curved,’ says Jim. Curves are seriously hard work when creating a building, and Jim concedes with a smile, ‘it’s been a challenge but I thrive on that.’ Perhaps it’s good to note at this point that he has remained on great terms with the architect, contractor and the rest of the team – no mean feat after such a long project. He and Eldridge certainly had plenty of chance to get to know each other. Such was Mason’s perfectionism that he and the architect spent a week in Carrara sourcing the marble direct from the quarry and also visited Ferm Vals in Switzerland to see the Peter Zumthor-designed spa there which provided inspiration for the use of brass in the house, particularly on that spectacular staircase. Outside the house has been every bit as carefully thought out with a green curtain of hornbeams screening the site and features including a natural swimming pond.